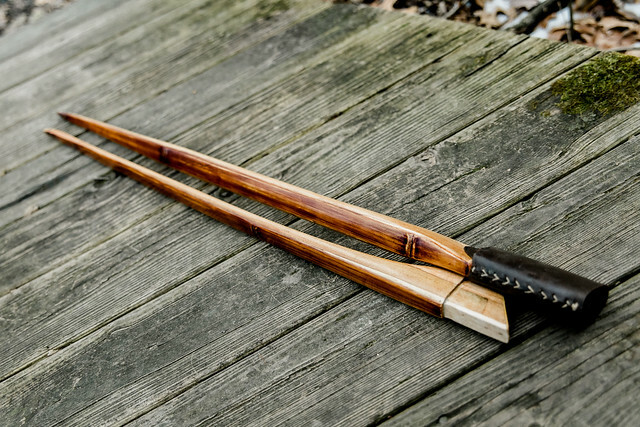 I am showing off my latest build, a Bamboo backed Black Locust American Semi Longbow. 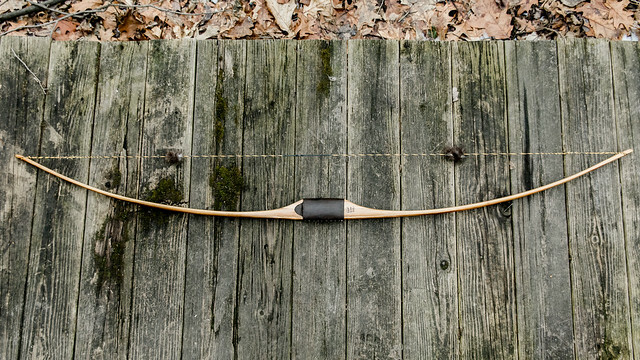 This bow started out as a pair of black locust billets that were tapered with a jointer and connected together with a tapered finger splice. The bamboo backing was glued on and 1-1/4” of reflex was added at the same time. A 15” power lam was added at the same time to further strengthen the center of the bow. 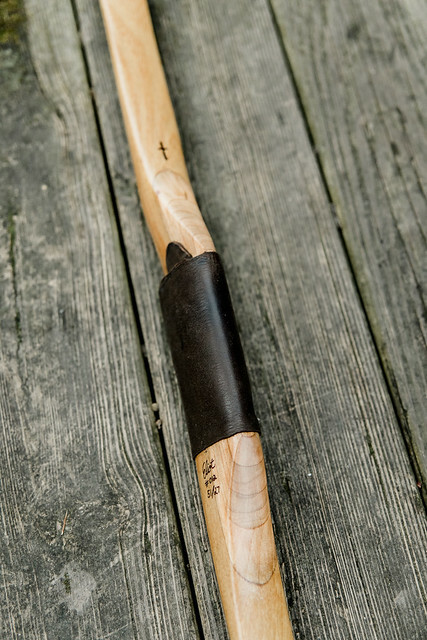 A 12” long block of black cherry was glued on the belly to serve as the handle. After tillering the bow I cut it in half and used fiberglass mesh and epoxy to make it into a takedown bow. The takedown system works well and is completely solid when put together. This was my first asymmetrical bow build. I found the tillering to be slightly more difficult then a symmetrical bow since the limbs do not bend at the same radius from the difference in lengths. 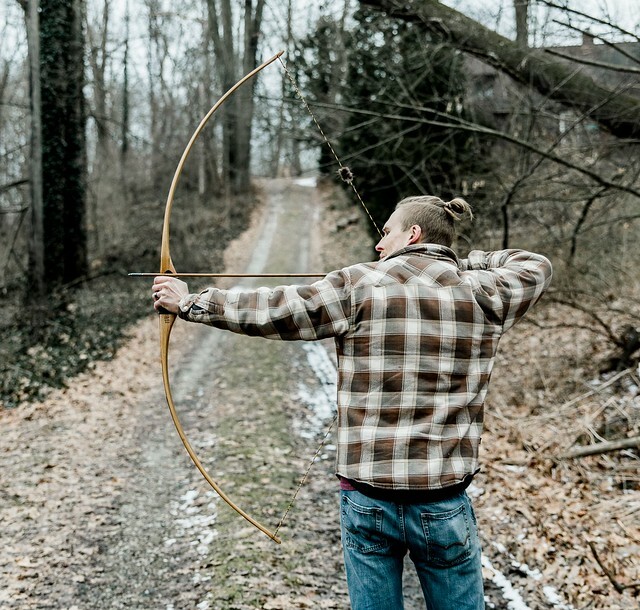 The bow is very stable in the hand throughout the entire draw. I can’t say if the asymmetrical design or just good tillering that is the cause for the stable draw. 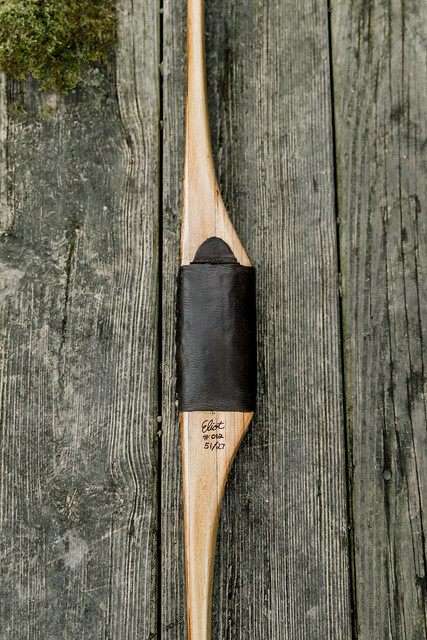 The bamboo back was stained with a cordovan leather dye and the bow was finished with 6 coats of water-based spar. 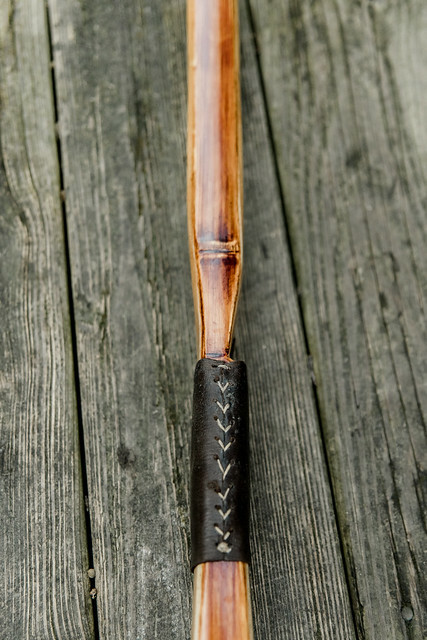 A chocolate leather grip and arrow rest was added with artificial sinew stitching to finish it off. 66 ¼” long NTN, 51# @ 27”. Asymmetrical design with a 2” longer top limb. 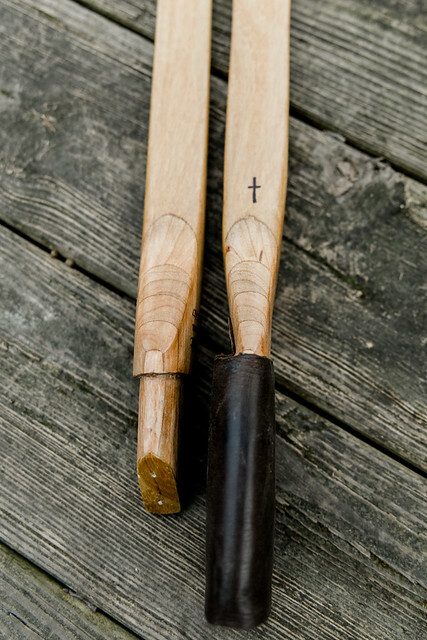 1-1/4” wide limb with a slightly willow leaf design tapering to ¼” tips. The bow ended up with ¾” string follow. The bow is a quick shooter for a string follow design and averages right at 170 fps with 10GPP arrows. I built this bow with the idea of a simple and dependable hunting bow. I believe it will suit me well on my adventures to come. Turned out nice. I like the handle. There is no shortcut for experience. 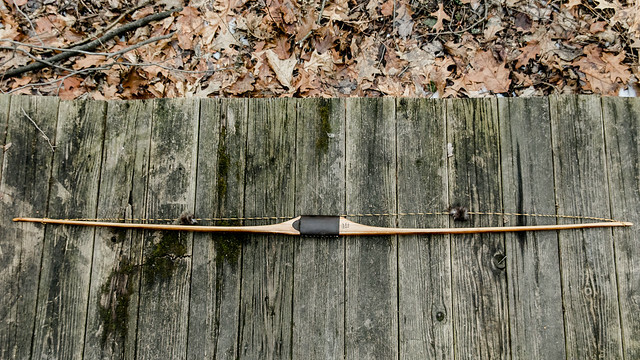 "The bow is very stable in the hand throughout the entire draw. I can’t say if the asymmetrical design or just good tillering that is the cause for the stable draw." Yes, that's one of the benefits of the asymmetrical design. 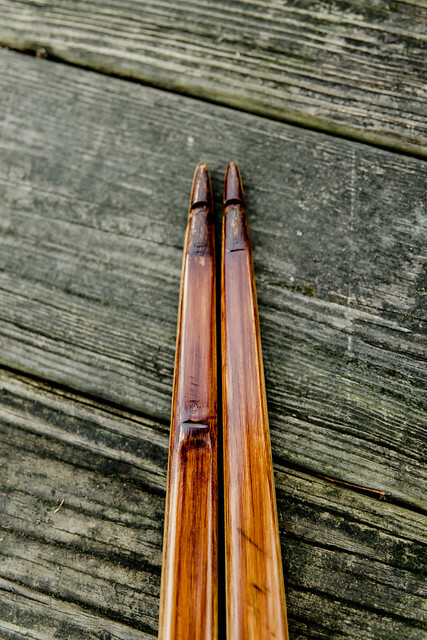 The bow center and bow and string hand fulcrums are generally in closer proximity to one another, it's even possible they can all reside in the exact same spot, which allows the bow to achieve dynamic balance sooner in the draw... even perfectly balanced right from the very beginning. Many folks claim they can't feel this, but usually it's because they never have and don't know what they're missing. This balance has other, more practical rewards in shooting characteristics, arrow 'tuning', maintaining tiller, thwarting set, etc. 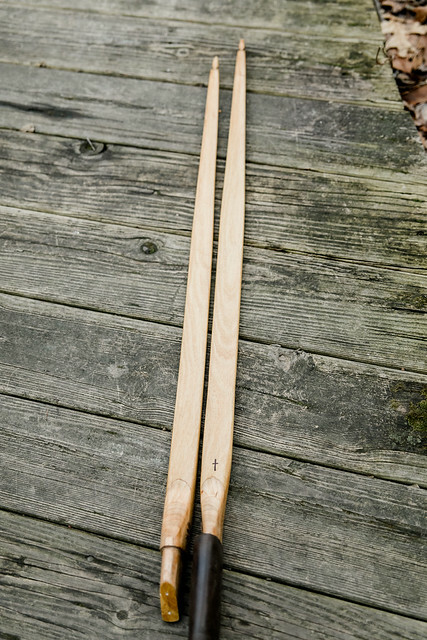 Symmetrical bows on the other hand, with the bow center 2" away usually, tilt in the hand until the sliding fulcrum is dealt with by relative limb strength.... assuming it IS dealt with.... or lucked into. Nice work on the takedown and the tiller looks spot on. Is that a thin piece of wood glued on the tenon? Beautiful bow and great job! Good looking bow. And fast!
" Vegetarian" a Native American term for bad hunter. Another nice bow Taylor!! I like your design and execution! The takedown is awesome!! Thanks everyone for the nice comments, I appreciate it. BMorv, I glued a thin piece of osage on the end of the tenton to ensure the edge grain could not splinter or swell up and cause issues with the takedown sleeve. Sound good SS. I ended up going with G-10 on the one I'm working since it's proven and I don't like to experiment with something I'm giving away, but I definitely will keep this in mind when/if I build one for myself.